Bob Moog's final project carries his visionary synthesizer design into the future. The man may be gone, but the legendary name and instruments live on. 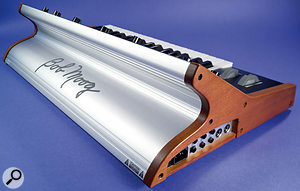 Before his death in August 2005, Bob Moog worked tirelessly on the development of a new synth aimed at those operating with restricted finances (in other words, practically the entire musical community). While the top-of-the-range Voyager roamed the galaxy, notching up stellar reviews and accolades from star players, the man whose surname is virtually synonymous with the word 'synthesizer' was down on earth designing a more stripped-down instrument which would offer classic Moog features in an attractive yet affordable package. The result is the Little Phatty monophonic analogue synthesizer, Bob Moog's last design and parting legacy to the North Carolina-based company who carry on his work and his name. To British ears, 'Little Phatty' sounds like a childish nickname designed to hurt the feelings of a younger sibling, so to avoid tears at bedtime let's call the little fellow 'LP' for short. 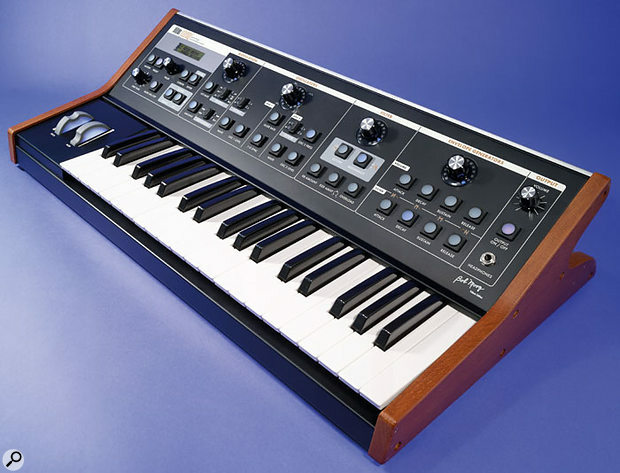 The LP has a three-octave (C to C), 37-note keyboard — this is seven notes fewer than the Voyager, which (like the original Minimoog) goes down to a low F. A pair of octave buttons allow the player to access two lower and two higher octaves, giving the keyboard an effective playing range of seven octaves. Played from an 88-note master keyboard, you can access the full range over MIDI without any button-pushing, but the LP's compass extends still further — its analogue oscillators produce discrete musical pitches over nearly nine octaves, virtually the entire MIDI note range. I'm very glad to say that unlike most of its competitors, this synth has a proper built-in power supply rather than one of those hateful little wall-wart adapters. The word 'professional' springs to mind, and better still, the synth will work straight out of the box with anything from a 90 to a 250 Volt power source. Congratulations to Doctor Bob and the manufacturers for not compromising on this important point. As you can see from the photos, the LP has some unusual and eye-catching design features: the control panel is fitted at a 45-degree angle which emulates the adjustable tilt of a Minimoog control section, but unlike the Mini, the LP's panel is fixed in position and won't come crashing down on your fingers at the slightest provocation. The back view reveals a sharply concave silver-white metal surface running the length of the instrument. In tribute to its maker, this bears Bob Moog's embossed signature rather than the iconic Moog logo. Wooden side panels add a nice vintage touch, a nod to Dr. Moog's illustrious past. The unique curvy shape gives the unit a distinctive and stylish look, but for me the killer design feature is the intense blue backlighting of the pitch and mod wheels (a feature borrowed from the Voyager) and the big, bright circular blue and purple LED's. These give the LP a truly sci-fi feel — I kept turning off the lights in my music room so I could admire it glowing in the dark. Brilliant, in both senses of the word! Though the LP offers massive sonic control, it features fewer knobs than you'll find on a vintage synth. The reason for this is that rather than pursuing the old 'one-knob-per-function' approach, the synth has four master rotary controls (one each for modulation, oscillators, filter and envelope generators) which can be assigned to a variety of parameters via 26 push buttons. To assign (say) Oscillator 2's pitch to the master oscillator control, you simply press the 'OSC 2 FREQ' button, which will obligingly glow bright blue. The oscillator control knob now controls Oscillator 2's tuning until such time as you assign it a different parameter. Each of the master controls is surrounded by a ring of 15 miniature blue LEDs which show the current setting — these look great and provide useful visual feedback when creating or editing sounds. The simple, logical front-panel design scheme is clean and uncluttered, and helps make programming quick and easy. LP has two voltage-controlled audio oscillators (VCOs) and an LFO which is used solely for modulation — its direct signal can't be fed into the mix. The oscillators have four octave settings (16', 8', 4' and 2'); Oscillator 1's fine tuning is determined by the global tuning control, while Oscillator 2 may be tuned up or down a perfect fifth relative to Osc 1. The VCOs have individual volume controls, which is far preferable to the single 'balance' control you find on many modern synths. 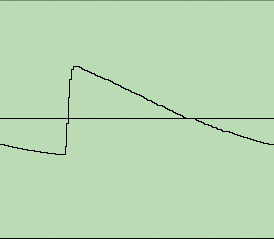 Rather than the six fixed waveforms offered on a Minimoog, the LP's VCO waveforms are continuously variable and range from a smooth triangle waveform to a thin pulse wave, via the traditional sawtooth and square waves which form the basis of all simple synthesis. Unlike the '70s synth, the LP has no noise generator. This won't be a problem if you plan to use it for tasteful melodic work, but avant-gardists may miss the ability to launch sheets of shuddering pink noise at their cowering audience. However, the LP has its own ways of creating sonic mayhem, which I'll explain shortly. The filter used in this synth is the much-admired Moog 24dB-per-octave low-pass type. It sounds smooth, creamy and natural, and being analogue there's no danger of it generating the 'zipper' noises produced by some digital filters. One welcome innovation is the filter's 'overload' parameter, which adds a bit of controlled grunge and makes fat — sorry, phat — bass patches sound even more ballsy. The filter and the amplifier sections have identical ADSR (attack, decay, sustain, release) envelope generator circuits — the release can be turned off globally if you want to make sure none of your patches go on sounding after you release the keys. 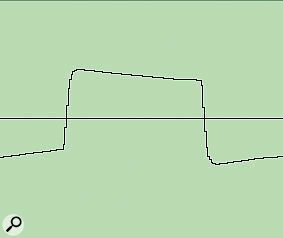 I found that after the customary fiddling with the decay, sustain and filter cutoff settings the envelopes produced plenty of 'snap' and were clearly capable of responding instantly to the fastest lines keyboard players can throw at them. 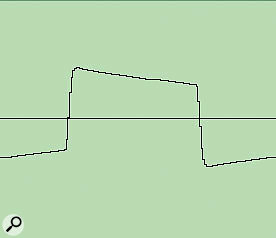 For a quick blast of nostalgia, the good old 'glide' control permits pitch slides of up to five seconds over the keyboard's three-octave range. 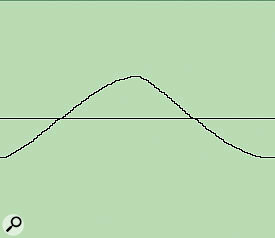 These parameters ensure a very good replication of a Minimoog's sound and operation. The fact that they are now fully programmable is a huge advantage, and means that the panicky mid-song knob-twirling '70s synth players had to do in order to change patches is now, thankfully, consigned to the past. The LFO has a choice of four fixed waveforms and a frequency range of 0.2 to 500 Hz. The lower frequencies are more than adequate for conventional vibrato, pulsating rhythms and mad arcade-game sound effects, and the upper range can produce all manner of wild timbral distortions. If you need a higher-pitched modulation source you can select Oscillator 2; this introduces FM-style, clangorous and ring mod-type noises, opening up still more avenues for those seeking to make a truly fearsome, ear-bending racket. 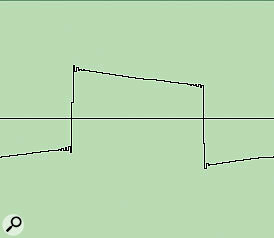 By using the filter envelope as a modulation source and applying it to pitch, you can introduce pitch-shaping ranging from a gentle lilt to a howling, siren-like alien scream. 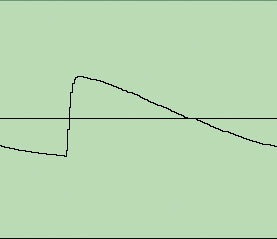 On a more subtle note, the VCO's pulse wave width can be modulated, which facilitates the creation of nice string and Farfisa organ sounds. Hearing these rich, mobile timbres really made me wish that the LP was polyphonic! Another post-Minimoog innovation is that Oscillator 2 can now be sync'ed to Oscillator 1, which in tandem with the modulation options means you can create a wide range of flangy vocaloid sounds — big sonic fun. When it comes to tuning, there's good news and not-so-good news. On the plus side, the LP's global tuning is basically stable and its oscillators don't drift — if you tune them precisely together, they stay that way. However, there's no internal tuning reference or read-out, which means that if you want to be sure the LP is at concert pitch, it must be tuned to an external tuning source. The absence of an A = 440Hz tuning tone makes life a bit complicated; if you're planning to use the instrument on stage, your options are either to tune the LP to another keyboard which you know is in tune (most digital workstations have a tuning read-out) or buy yourself a decent tuner. Like most analogue synths, the LP's pitch takes time to settle after power-up, so you should allow at least 40 minutes between turning it on and performing your final pre-gig tune-up. One helpful feature is that once you've got the LP in tune, there's an option to deactivate its master tuning control, thereby preventing accidental detuning if your hand should inadvertently brush the control. 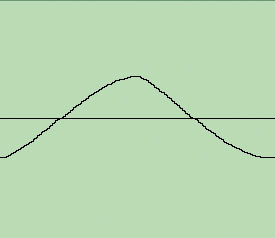 I noticed that the review unit's octave scaling was out by just over a cent (100th of a semitone) sharp per octave, resulting in a discrepancy of 10 cents over six octaves. This is too small a figure to cause any real problems, but if the scaling were to deteriorate it would require a visit to the service department, as this parameter can't be adjusted by users. 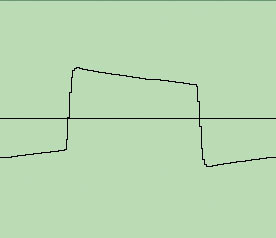 The LP's 'master' section contains all the instrument's global parameters: independent MIDI In and Out channels, pitch-bend amount (which, rather eccentrically, goes from one to five semitones then jumps up to seven or 12! ), and keyboard priority — you can set this to lowest (as on the Minimoog), highest or last note. 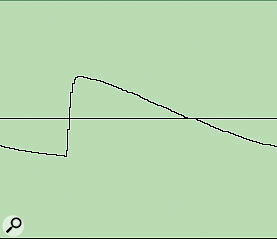 A 'legato off' setting means that the envelope generators re-trigger every time you play a new note, regardless of overlaps — this is handy if you're performing a boingy bass line which needs a filter 'twang' on every note. The master section also contains some hip filter stuff — the filter cutoff (but not the amplifier) can be set to respond to velocity, which is a great aid to expression. 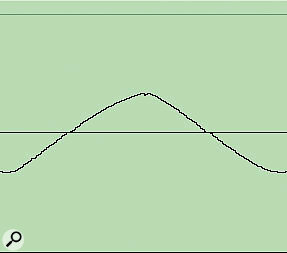 You can also change the filter type from the default four-pole (24dB per octave) to three-, two- or one-pole — the latter has a dramatic effect on the sound, rendering the filter dirtier and more buzzy and making the LP sound more like a Wasp or an ARP Odyssey. Being a global setting, any change to the filter type affects all presets, but it's a simple matter to temporarily select a different type of filter for a particular patch. One feature which will please deep programmers is that in addition to the approximate read-outs for each parameter indicated by the ring of 15 LEDs round each master control, there's a 'precision mode' function which displays each selected parameter's value as an on-screen number. The supremely logical and well-written manual confirms that we're dealing with a well thought-out, professional instrument. The best way to judge a synth's sound is to use your ears — my pair (rented from Audio FX) told me that LP's raw, unfiltered VCO waveforms sound good, strong and constant, and have the size, bite, warmth and presence one expects from a Moog synth. I also noticed that there was a minor difference in sound compared to my early '80s Model D Minimoog — this is not intended as a criticism, since the new synth was not intended to be a Minimoog clone. Having said that, it's still interesting to compare the sound of the latest Moog synthesizer with one manufactured 25 years earlier! 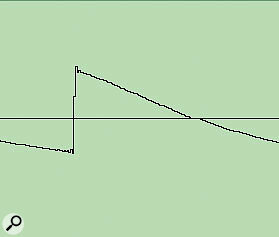 Minimoog triangle. Little Phatty triangle. 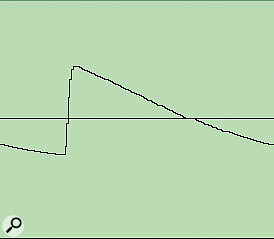 Minimoog sawtooth Minimoog sawtooth (cutoff frequency reduced). Little Phatty sawtooth. Minimoog square. Minimoog square (cutoff frequency reduced). Little Phatty square.With their filters fully open, the two synths' triangle waves sounded identical, but the Minimoog's sawtooth and square waves sounded brighter and buzzier than the LP's. By slightly reducing the cutoff frequency of the Mini's filter it was possible to match their tone exactly. 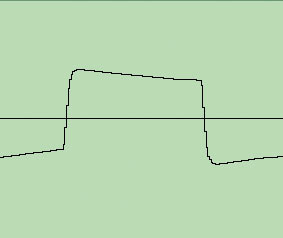 Having done that, the only remaining difference I could discern when comparing the sawtooth and square waveforms was a faint impurity (which sounded like a hint of frequency modulation) in the LP's higher notes. We're talking tiny traces here — to all intents and purposes the two synths sound the same, but audiophiles will be able to hear this small discrepancy. 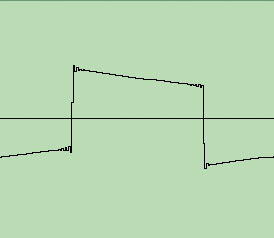 These drawings show Logic 's graphic representation of the waveforms generated by my Minimoog D and Little Phatty, using a MIDI note playing the pitch of Middle C. Except where shown, both synths' filter cutoff frequency was set to maximum. 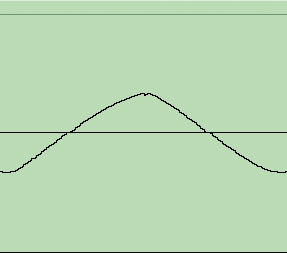 As you can see, apart from a tiny notch in the top of its triangle wave, the LP's waveforms look practically identical to those of a slightly filtered Minimoog manufactured 25 years earlier! Although the LP's LFO does not sync to MIDI clock, all of the synth's programmable front panel controls send out MIDI CC data when you tweak them, so you can record filter sweeps and so on into your sequences. Great. To aid performance flexibility, 'performance mode' offers four programmable banks of eight presets which you can step through sequentially in either direction — a nice simple way of putting your patches in the right musical order. If your show runs to a sequencer, you can automate patch changes by recording MIDI program changes into the sequences, leaving both hands free to play outlandish jazz scales, make triumphant gestures at your adoring public and perform those essential 'more of ME in the monitors!' upwards pointing motions at the sound guy. I liked the LP's 'output on/off' button — you can leave the master volume turned up but kill the output with one button push, useful if you want to check a sound on headphones without the entire audience and your bandmates hearing you do so. As you would expect, this synth is mono and has no internal effects; it also lacks a digital output and any kind of computer connectivity other than MIDI, which is kind of a relief. It does have an 'audio in' socket for processing external signals, as well as good old-fashioned control voltage inputs for pitch, volume, filter and gate. If you attach a momentary footswitch to the latter, you can trigger the volume and filter envelopes with a foot tap; alternatively, you can get the same effect by applying a 5V gate signal, which would be a good way (indeed, probably the only way) to get the LP's filter to open and shut rhythmically in time with your sequences. The LP ships with 100 factory preset sounds. These can be overwritten with your own patches, but the factory sounds can be restored en masse via a simple 'system utility' procedure. User patches, performance settings and the instrument's operating system may be backed up via MIDI SysEx (System Exclusive) dumps into a sequencer or other external MIDI recording device. The LP's SysEx dumps support anything from an individual patch to the satisfyingly named 'bulk dump'. As the operating system can be saved as SysEx data, I assume that any OS updates issued by the manufacturers will be in the form of downloadable MIDI files. I felt the factory presets were pretty good without being wildly impressive. There are some good patches lurking in the list, but in my view the LP has a lot more to offer. Such versatile instruments pose a challenge to their owners — it can take a very long time to get your head round what exactly is going on when you first set up a complex modulation routing. Half the time, adjusting a control produces no change at all to the sound, which can be off-putting. The truth of the matter is that if you're patient and take the time (not easy to do in an age when everyone expects instant, push-button results), you will find whole worlds of unexpected sounds hiding beneath the LP's bonnet. Alternatively, you can scurry back to your soft synths and go through ten million presets looking for the right one, but believe me, it's much more enjoyable (and satisfying) to build a patch yourself using physical knobs and controls. Looking at the old photos of Keith Emerson, Wendy Carlos, Tonto's Expanding Head Band, et al, surrounded by a forest of patch leads and piles of modular Moog gear resembling a '40s telephone exchange, it's easy to get the wrong idea about analogue synthesis. According to vintage synth enthusiast Gene Stopp, Emerson's main modular Moog patch consisted of three oscillators, a voltage-controlled filter, a voltage-controlled amplifier and modulation — in other words, the same simple building blocks found on the Minimoog, the Voyager and Little Phatty. Many of the patches on Wendy Carlos' groundbreaking Switched On Bach also sound as though they could have been created on a Minimoog without too much bother. This proves that you don't need a room full of equipment and a Donald Trump budget to make musically effective synthesizer sounds. A retro record label of my acquaintance — I've forgotten who — use as their motto the words 'Into the future with the past!' That seems as good a way as any of summing up the LP's essence. It's a pleasure to review an instrument with such a distinguished pedigree, and gratifying to discover that the blend of old and new features is not just a marketing ploy, but a genuinely powerful and versatile new design capable of producing impressive musical results. Sound creation can be a tiresome business, but the LP goes a long way towards making it easy and fun. I cut my synthesizing teeth (so to speak) on a Moog synth — it was an inspiration to me, and I hope the Little Phatty will inspire as many young players as Bob Moog's creations did during his lifetime. It does indeed sound 'phat'. The modulation matrix enables all sorts of mad sonic explorations. Extensive MIDI control and new 21st-century functions add flexibility and expression to the classic '70s Moog sound. It's a lot less expensive than the Minimoog Voyager and in real terms, a good deal cheaper than the original Minimoog was back in the day. 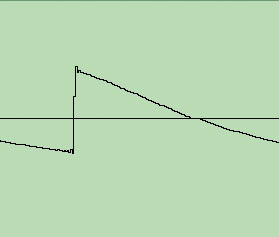 The absence of an internal tuning reference or read-out makes tuning a bit complicated. While its contemporary features are very welcome, the LP's most powerful weapon is its classic sound. Analogue circuitry, convincing VCO waveforms and the unbeatable Moog filter evoke the golden age of synthesis and remind us that there's life outside the desktop studio!